My friend Maja gifted me with a few pieces from her collection of Native American pottery shards she found while hiking in New Mexico. 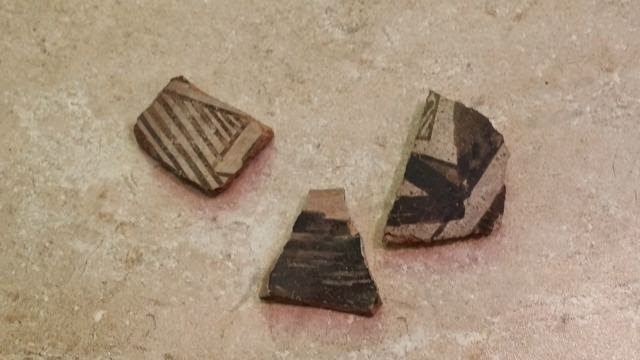 These shards are probably around 300 years old, now are sitting on my art desk, inspiring me! These three spoke to me and I decided to make a push mold. 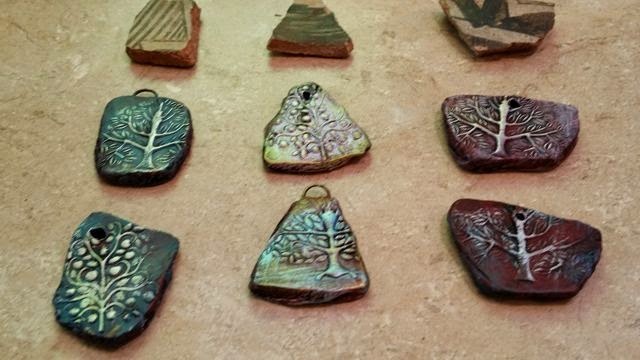 I love the fragmented edges and these are just the right size to create small pendants or charms. 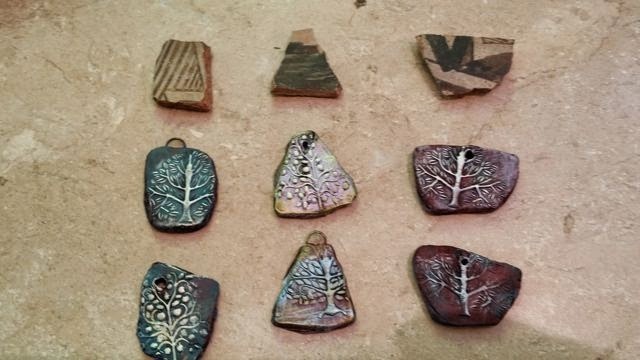 Here are my first few shards, impressed with a 'tree-of-life' stamp, then painted with Violet Oxide, and several layers of Golden paints. Finished with highlights of shimmery gold. 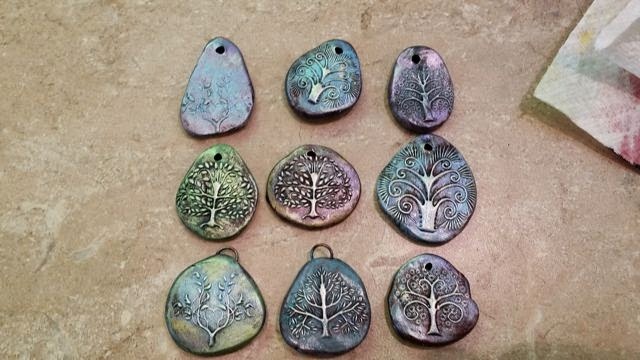 So, I got crazy with my new 'tree of life' stamps and impressed a few more pendant/charms. Thanks for stopping by! I'll be posting more pics of the newest Spirit Dolls and the process of how they come about! 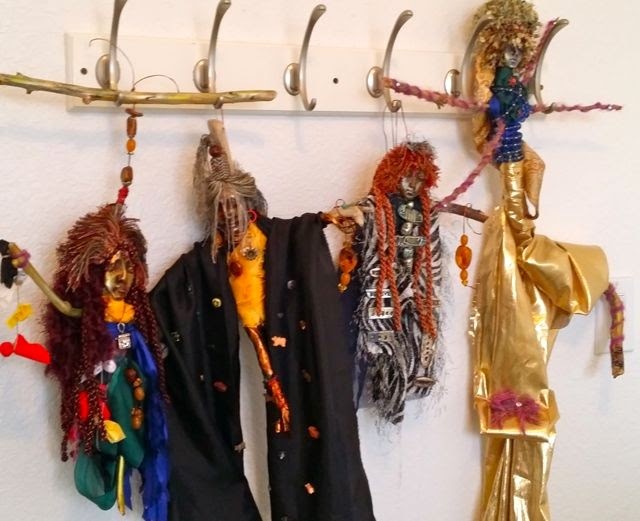 Here are our four Spirit Dolls... Each doll is made with sticks gathered from the Santa Cruz Mountains near the place where we all first met one another almost six years ago. Also, each doll supports a piece of amber. Other than that, we allowed the 'Spirit' of each doll to inform our creations. 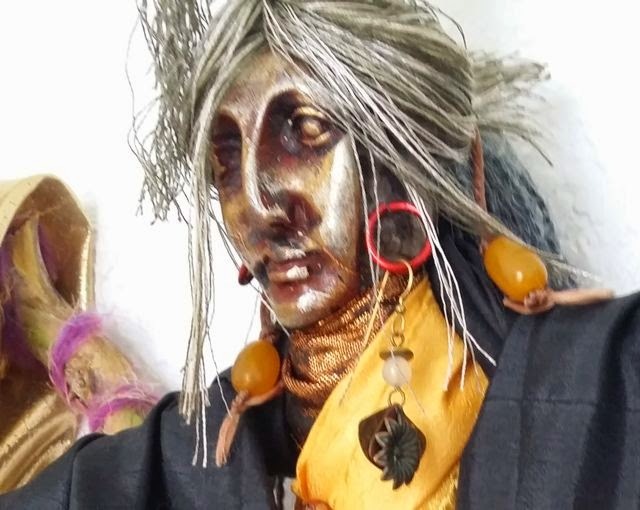 A closeup of her amazing work... the hair is a tassel that blends into the grey hair. She originally just pulled back his hair to get it out of the way... but it looked so great! She braided a rope of sinew and tied on two amber beads to hold his hair back. So beautiful! 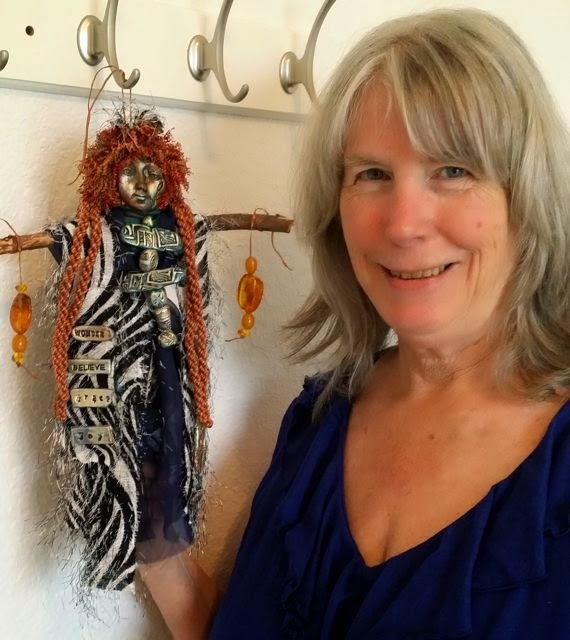 And here is Joyce with her amazing new Spirit Doll. 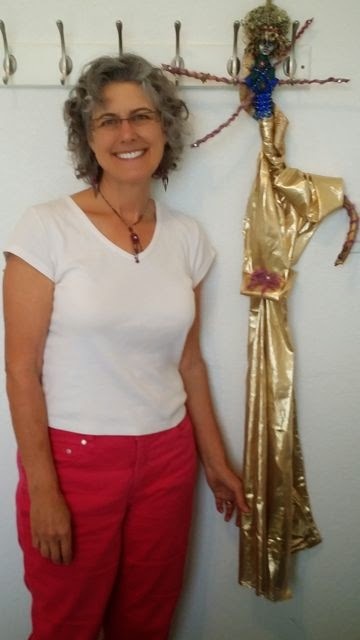 She will hang in Joyce's Reiki Center, with the gold lame skirt draped against the wall. 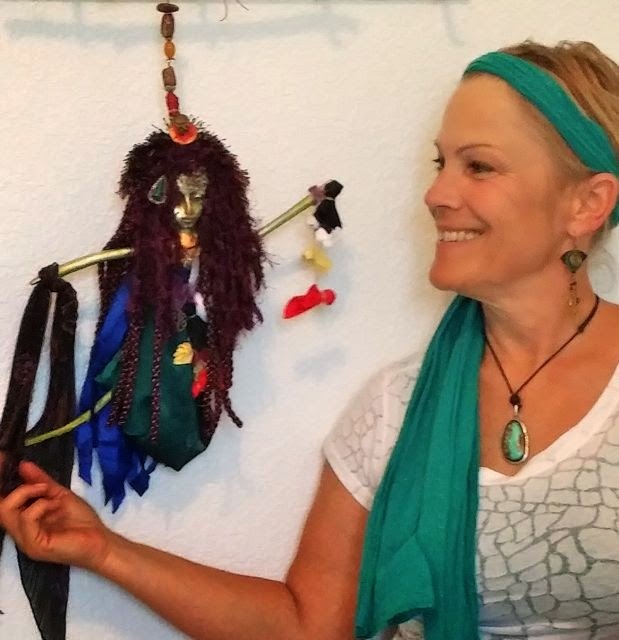 Joyce used two different Designer Trim samples to create this amazing headdress. I love the jewels. Here is Maja and her beautiful TWO SIDED! 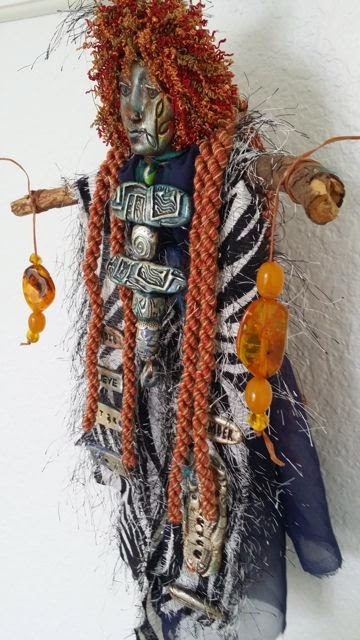 Spirit doll! 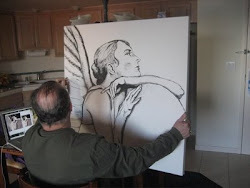 One side represents the Maiden, the other side represents the crone! Note the Prayer Ties. 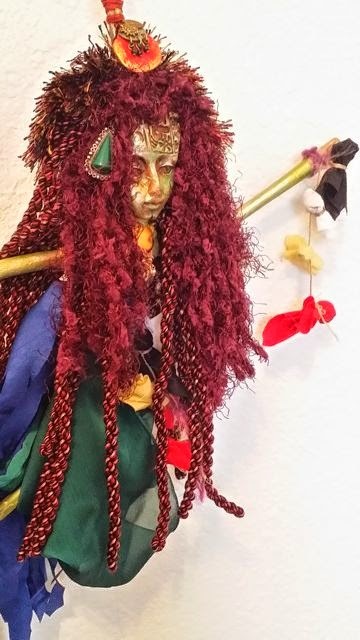 I have another closeup of the Crone Side, this is the Maiden. 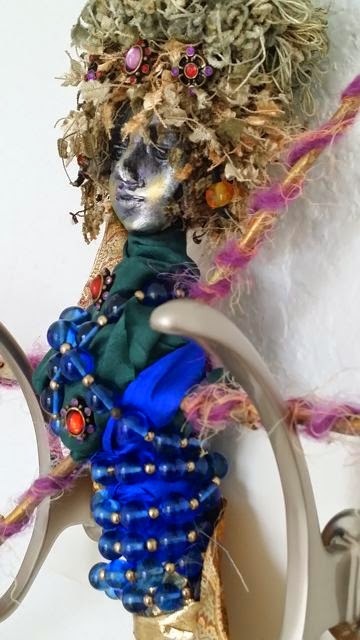 After this picture she added a crystal wand for the Crone and a archeological shell as a fan for the Maiden! 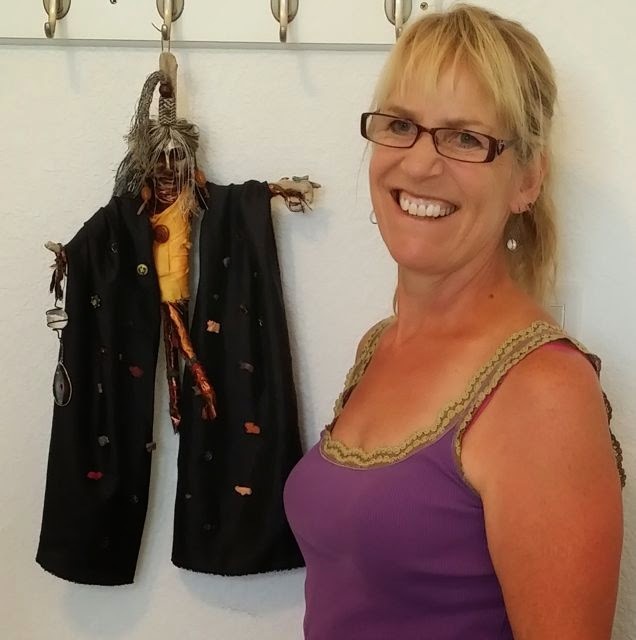 Finally, here I am with my Spirit doll. I loved the black and white Designer Fabric sample so I made a simple drape, then put just a wisp of the fabric in her hair. Getting ready for the quilt show this weekend.